Benin Republic’s most popular export, Djimon Hounsou, is an award-winning actor and model who has starred in numerous movies, most famously Gladiator in 2000 and Blood Diamond in 2006 for which he got an Academy Award nomination for Best Supporting Actor. Hounsou continues to be a source of inspiration to African children who aspire to make it big in Hollywood. Here is all you need to know about him. Djimon Hounsou was born Djimon Gaston Hounsou on April 24, 1964, in Cotonou, Benin Republic’s largest city and economic capital. He is the fifth child of his parents; Albertine and Pierre Hounsou, who worked as a cook in Ivory Coast. Hounsou had a tough upbringing as he grew up without his parents. He only met his father for the first time when he was around the age of 10. By the time he was 13, he and his older brother, Edmond, moved to France on a student visa. However, almost soon after they arrived, Hounsou dropped out of school and had to live on the streets as well as scavenge for food from the trash. He was also no longer legal in the country which meant he had to avoid getting noticed or caught by the police in order to avoid deportation. What came to his aid was his good looks as he was noticed by a photographer who saw potential in him becoming a model. The photographer invited him to an audition where he met famous French designer, Thierry Mugler who helped to establish him as a high-end fashion model. As a model, Hounsou traveled the world. His collaborations with Mugler took him to the United States in 1990 where he began to pursue his longtime ambition of being an actor. He started by appearing in music videos such as Janet Jackon’s ‘Love Will Never Do (Without You)’ and Paula Abdul’s ‘Straight Up’ before getting his first movie role in ‘Without You I’m Nothing’ by Sandra Bernhard. A couple of appearances followed on some popular TV series such as ‘ER’ and ‘Beverly Hills’ before catching his big break in the 1994 Science fiction film ‘Stargate’ by Roland Emmerich. An even bigger role came three years later in the 1997 Steven Spielberg film titled ‘Amistad’ where he featured alongside Anthony Hopkins and Morgan Freeman. Hounsou described the movie as a powerful story about Africans that define African Americans’ legacy in ways which a lot of people are not comfortable discussing. The movie, however, certainly defined him in Hollywood. He further proved himself in ‘Gladiator’ (2000) and then in ‘In America’ (2004) which got him an Oscar nomination, making him the fourth African male to ever get one at the time. Another Oscar Awards nomination, as well as nominations from the Screen Actors Guild and Broadcast Film Critics Association, came for his performance in ‘Blood Diamonds’ in 2006. He, however, only won the National Board of Review Award for Best Supporting Actor. Since that time, Djimon Hounsou has worked on more than 20 different screen projects as well as continued his lucrative modeling career. He does a lot of charity work and is also a prominent and outspoken activist in the fight against climate change. Djimon Hounsou’s net worth is estimated to be around $12 million. His inspiring story of rags to riches saw him build a modeling career which had him working with internationally renowned brands such as Calvin Klein. He has also gone on to become a respected Hollywood actor who has starred in more than a few notable productions. 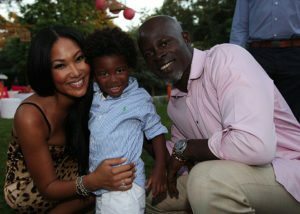 Djimon Hounsou was married to former fashion model Kimora Lee Simmons, who was previously and most-famously married to Def Jam founder, Russell Simmons. Some reports, as well as statements by the duo of Djimon and Kimora, however, insist that they were not legally married. They only performed a traditional commitment ceremony in Hounsou’s home country which they clearly described as also not being a wedding ceremony. The couple who separated in November 2012 was blessed with a son, Kenzo Lee Hounsou, born on May 30, 2009.